As we all know and have discovered at times during summer it can be difficult to fall asleep when you are hot and sweaty, and the sheets are sticking to your skin. With a small air conditioner, you can choose the temperature that is most comfortable for you, making it easier for you to fall asleep. 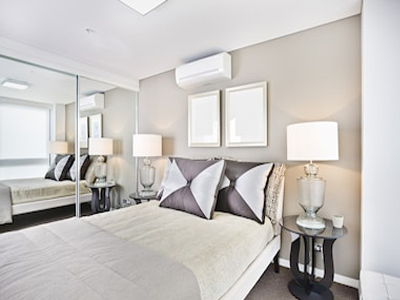 Using aircon units in your bedroom can also help to reduce humidity by removing moisture from the air, keeping you from getting sweaty in the middle of the night. If you are worried about the noise keeping you awake, you need not be. Most modern air conditioning units, particularly the smaller ones, are designed to run very quietly so they won't interrupt your sleep. Air con is not just good for your comfort; it can be good for your health as well. Most aircon units now have built-in filtration systems to remove dust, toxins and other pollutants from the air so that you can breathe easier. This can help to reduce your risk of getting sick by minimising your exposure to harmful toxins and bacteria. If you suffer from breathing problems and find your bedroom stuffy then a bedroom air conditioning unit can be a breath of fresh air. We have installed air conditioning units for customers who suffer from Sleep Apnea and they have noticed a large improvement to the air quality and this has aided them for a better nights sleep.